“Ruth” could be found, nearly every day, on a computer at the local library. She caught up with the state, national and world news. She read authoritative articles and blogs on health/medicine, nutrition, fitness; business, politics, government; education; culture; environment; animals. She kept up to date on happenings back in California. She applied for jobs in private transportation. She played online brain teasers, Solitaire, and action games. She was intelligent, curious, and friendly. She dressed neatly, and always smelled like roses, lavender, or French vanilla. Her full, curly black hair enveloped her full, glowing face. “Ruth” was homeless. Ordinarily, she lived at the back of a nearby closed-up gas/convenience business. When the temperature dropped to the 30s, she went to the Methodist Church’s shelter four blocks away. One of her friends, “Angie,” pulled a small luggage cart in and out of the library. It was loaded with a 14.5+ inch screen HP laptop computer in a black satchel, a black accordion file case full of papers, and a large handbag with an app-loaded cell phone inside. She plugged her computer into the library’s WI-FI power plug. Then, she conducted online research. She wrote poignant letters to the editors of newspapers around the U. S. She emailed government officials, congressional subcommittees, and non-profit leaders about societal, employment, economic, and health legislation and imbalances. Discreetly, she snacked from a pocket-sized re-sealable plastic bag. “Angie” was homeless. She was also a former Fortune 500 businesswoman. Certain Methodist Church parishioners kept an eye out for both women. They made certain that “Ruth” and “Angie” had a safe, hygienic and warm place to shampoo their hair, and bathe regularly. A place to launder their clothes. Ways to live “in mormalcy,” as Ruth put it. For a little while, anyway. Between Ruth’s and Angie’s usual street lives. For the homeless, having a “place to live” is an urgent necessity. And, it is the moral responsibility of the rest of us to help those with such dire needs. How do we provide a home for our homeless? Focus emphasizes (1) getting large Federal grants (eg. $6 million) and (2) emulating homeless housing programs, like the one in Houston, Texas. They focus on designing, building, and developing an all new housing complex for the homeless. 100 percent code compliant facility. Property custom designed and retrofitted for a set purpose, and specific type of occupants. Management intensive, and top heavy. Heavily dependent on government, public, corporate, and political backing. Operations and administration wrapped in red tape and beauracracy. Takes 1-to-2 years, or longer, to get from conception to “Open for Occupancy” stage. More communities around the U. S. are getting very practical and quick responding in their approach. Focus emphasizes: Converting existing multi-family, unit housing into code certified transitional homes for the homeless. Property is located within established community. Housing sets within proximity of jobs – eg. entry-level, renewal, lower-skilled jobs. Structures are solid and adaptable to comply with local codes, state regulations, etc. Facility is part of the neighborhood. Facility can get up and running much faster. Administration, management, and operations are more grassroots and mission oriented. Structure may need major repairs and upgrading to comply with local codes, and state and federal regulations. Property and/or business may have liens and old bills attached to it. If located in a run-down neighborhood, serious problems may be embedded – eg. drug trafficking, vandalism, numerous abandoned properties. Maintaining safe property environment may be difficult, dangerous and costly. Both housing solutions named here are viable. Deciding which direction to take depends on many factors. Many more than I can name. Many beyond my background and capabilities as a painter and decorator. My mother told me recently about “Symphony Sam.” That’s the name she gave the homeless man that played virtuoso-quality music with his violin, in Chicago’s Pedway. And, he handed out free copies of the official Vietnam Veterans of America newspaper. She met him one morning, in the Pedway between Randolph Street and Michigan Avenue, and S. LaSalle Street. She took the underground walkway, when Chicago’s temperature dropped to the 30s (wind chill factor 20 degrees or lower), and freezing winds bit into one’s cheeks. Prior to serving three tours of duty with the U. S. Marines, “Symphony Sam” taught music at Julliard. Also he played Second Violin, part-time, with the New York Philharmonic, and violin in the orchestra of an on-Broadway theatre. WHAT DOES “Symphony Sam” HAVE TO DO WITH PAINTING? After “Symphony Sam” was released from the military hospital in Japan, he returned to the United States. The only job he could get was painting sublet apartments for a New York City real estate company. He lived with a fellow Vietnam Veteran and his wife, in a small, three bedroom flat. One Christmas, he ended up on a Greyhound Bus, as it pulled into the main terminal, in downtown Chicago. He told my mother that he never remembered buying a ticket, and getting on that bus. He said that he checked into a cheap, but clean hotel on Randolph Street. 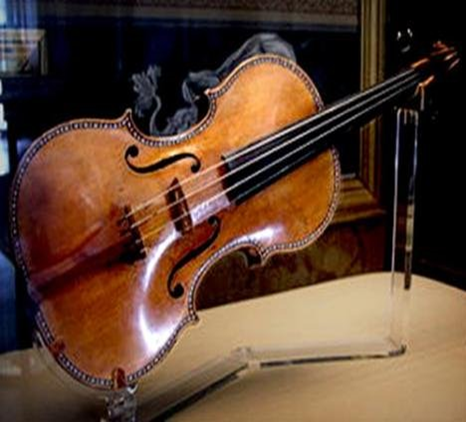 He carried a few clothes in a small suitcase, and his Stradivarius violin. No painting tools. The hotel’s manager helped “Symphony Sam” get little painting jobs at other small hotels, located in the Loop. One night, he suffered a severe PTSD episode. He said that he’d been fortunate. All of his previous attacks, in New York and Chicago, had been mild ones. He ended up in Michael Reese Hospital on the South Side. My mother saw “Symphony Sam” for the last time in 1989. The week before Christmas. “He wore a newer, used suit, and a pair of polished black boots,” she told me. “Symphony Sam” seemed content,” Mom told me. But, her eyes told me a different story. A major concern of hers, over twenty-five years later. “Florida has ‘Symphony Sams,’ too,” said my mother recently. On “FLASHPOINT,” two Central Florida homeless coalition officials were describing the modern housing facility to be built for the homeless in the area. A plea was made for major capital support from corporations. “I would offer these people a much quicker solution.” I told relatives during Thanksgiving. Here’s one proposal to help people like “Symphony Sam” have a safe, clean home – and a chance at a better life. Rescue a few smaller hotels and motels along U. S. Highway 192. The ones plagued by low occupancy rates, disrepair and damage, and the threat of foreclosure. Repair them. Reconfigure their rooms and public areas. Set up a central dining area for the homeless residents. Recruit homeless persons, who once worked as skilled construction workers. Put them to work. They can help in making certain repairs and reconfiguring the rooms and common (public) areas. Give them a chance to regain some of their dignity. Their basic skills, like riding a bike or typing, will come back to them. Offer these workers future housing there, when the property opens for occupancy. Give the homeless residents a good reason to take care of their respective room, and the overall property. Keep the housing as simple and practical as possible. Recycle whatever furniture, desks, fixtures, appliances, window treatments, kitchen ware, dishes, etc. that are in good condition. Repaint, re-stain and refinish all surfaces. By the way, expensive wallcoverings, flooring, furniture, and state-of-the-art systems are unnecessary. Research and reports about homeless shelter accommodations show that “pricier” amenities tend to make persons just off the streets nervous, self-conscious, apprehensive, distrustful, and even ill.
Every community has a “Symphony Sam.” A person who still possesses the skills and abilities, the passion, and the interest to give back! To get off the street! To once again become a more productive part of the universe. Every community has do-able options to meet the dire housing needs of the homeless. Every community has at least one existing multi-unit property, that can be converted in a time-cost-manpower efficient manner. Our local hotel GMs and their staffs can do only so much. They can help only so much. Their resources are very limited. Their ability to use their properties – which they do not own – is very, very limited. What needs to happen to provide safe and clean housing for the “Symphony Sams” in our respective communities? To get this job done sooner than two to three years after they become statistics? Local entities such as the Central Florida Coalition on Homeless and Central Florida Foundation (http://www.cffound.org) are proactive, and motivated. Special projects such as the “Reconstruction of Housing for the Homeless in America Project” focus on providing safe housing promptly. Professional and trade projects like the AIA’s new redesign/rebuild internship project tap young talent. Among other things, they offer fresh, new approaches to “reconfiguring and retrofitting” solid existing structures into great multi-occupancy housing. What is your community doing to get your homeless adults and children, into safe and clean housing?